Five Incentive Marketing Association (IMA) member companies Power2Motivate, Fusion Marketing, Corporate Rewards, Ciloyalty, and Solterbeck, and their incentive partners, took home awards for highly successful programs that improved sales and increased employee engagement through reward and recognition. 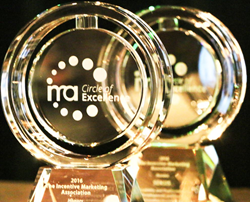 The 2016 IMA Circle of Excellence Awards Ceremony, sponsored by Peludica Glass, showcased a new award designed and contributed by Crystal D.
“This year’s award winners truly show how business improves with well-designed incentive programs that support business objectives,” said Joe Zanone, 2016 Circle of Excellence Awards chair. Five Incentive Marketing Association (IMA) member companies and their incentive partners took home awards for outstanding successful employee and sales incentive programs designed to help drive business. The 2016 IMA Circle of Excellence Awards were presented at the IMA Annual Summit in Houston, Texas last week. Power2Motivate was asked to provide an “out of this world” idea for Brother International Australia’s key back-to-school high sales period. The Brother $100K Prize Giveaway Program exceeded all goals for sales, participation, engagement and usage. The program, which increased sales by 28 percent over the previous year, was targeted to printer and hardware resellers across Australia. Travel incentives were selected for the top prizes because of the demographics and location of the business owners, who may not vacation often. For each minimum monthly purchase of Brother hardware resellers earned points toward a travel grand prize. Additional points and instant wins were earned through a “Spin to Win” game of chance where resellers earned instant points toward a wide range of rewards. Bupa, a large health insurance and care-home provider with more than 80,000 employees asked Ciloyalty to help restructure and rebrand its aging “Bupa Sales Academy”. Staff surveys and focus groups identified that personal recognition was more valued than prizes. The new “Bupa Boost” program focused on creating a culture of recognition and providing a morale boost to Bupa’s employees who work hard to look after the health of others. While the Academy focused on revenue goals, the Boost program put customers first by encouraging better outcomes for clients through smart business practices and strong customer service. Depending on their roles employees are rewarded monthly, quarterly and yearly. The Boost Reward Team also runs discretionary programs that complement the monthly and quarterly incentives, creating competitions that fill the gaps identified in the business’ capability or performance. Participation in Bupa Boost far surpassed the Academy with more than double the number of participants. The Incentive Marketing Association (IMA) connects members from leading companies across the marketplace to create a unified voice and growth for the incentive industry. IMA is the umbrella organization for the Incentive & Engagement Solution Providers (IESP), Incentive Gift Card Council (IGCC), Incentive Manufacturers & Representatives Alliance (IMRA), Incentive Travel Council (ITC), IMA Europe, and IMA Canada. IMA members have the expertise, leading brands and services to help companies improve their business with recognition, reward and engagement programs.